PRI Integration for Geriatrics (Minneapolis, MN)- An awesome weekend in the Twin Cities of Minnesota with the great team at IMPACT Physical Medicine and their course coordinator, Christie Amundson, PT, DPT, HFS, PRC. Their owner, Mr. Stan Babel is a long-time friend of mine and both a gentlemen and a scholar, simply stated. 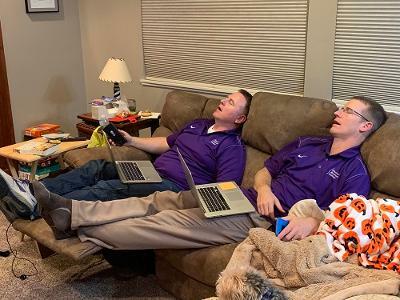 I have been fortunate enough to work with their clinic over the last 17-18 years teaching and consulting and Stan has always treated me with the upmost kindness and respect (and for the record, he takes me to the best restaurants in St. Paul). This weekend reminded me of all my friendships over the years within this organization and the many memories I've been able to make over the different generations of IMPACT employees during this time. A big thanks to all of you, past and present. There were a lot of great people from the Midwest in attendance, and I want to thank my two lab assistants, Christie Amundson, PT, DPT, HFS, PRC and Tom Tardiff, PT, DPT, CSCS, PRC for helping make the experience great for the class. You two were very helpful. Beyond all the great Minnesota people in attendance, I was especially appreciative of Matt Rosenboom, OT, for traveling all the way from New York City. I appreciate Matt for a couple of reasons, first because he was willing to travel away from the large coastal cities to attend a course like this in the Midwest, secondly, because he is an Occupational Therapist, and lastly, I love that he has already created collaborative learning with a hand full of PRI experienced people, including an old Protege of mine, Minh Nguyen, OT, PRC. I highlight the fact that Matt is an OT, because this course has Occupational Therapy written all over it. 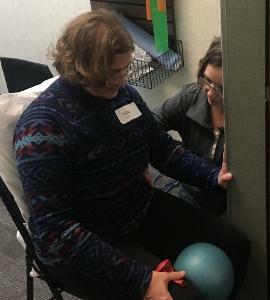 Besides Matt, there were 9 other Occupational Therapists in attendance and the Physical Therapists got to take time to explore the world of OT, not the other way around. This is meaningful for us because PRI has always been a big fan of interdisciplinary work and appreciating everybody's contribution to the "whole" team. The "Gerald" handout of patterned and preferred "Functional Routines" we discussed on the second day really sums up the functional objectives of this course and helps make the material very practical. This course has been a gem to share over the last 5 years, especially since completing the updates to the techniques section 2 years ago. People continue to love the exercise appendix, organized into bed, recliner, chair, transfer and standing sections. A couple of you have seen both versions of this course and provided us some valuable feedback on the updates. Thank you in particular, Stephanie Boespfug, PTA, PRC for your valuable insights and the positive feedback on how these new updates have helped you with clinical application working with Geriatrics. It was fun to have you there with us again. Another reason this course is so fun to present is that it serves as a great introduction to the science of PRI and helps connect people to our fundamental concepts in a simple and non-confusing way. 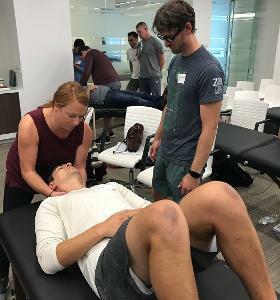 One course attendee wrote, "as a more experienced PRI clinician, I appreciated the amount I still learned exploring basic PRI concepts in this course." Another attendee from last weekend reported, "I am excited to get back to using PRI. I feel like I had stopped, but this course pulled some pieces together for me that I was definitely missing. Thank you." Another course attendee wrote, "Overall, one of the best courses I've been to. Great clinical application for all clinicians working with Geriatrics, not just home health. Pleasantly surprised with my ability to apply this in an outpatient setting. Thank you." Landing in Munich is like coming home for me. I have family here and I was afforded the opportunity to see my cousins and connect. My mother’s side comes from Munich and Bavaria and our roots are deep here. My sister wrote of my father’s meeting with my mother in WWII in a series of novels the first of which is called: The Reason of Fools by Dodie Cantrell Bickley (see the youtube trailer). After arriving in Munich we settled-in and then had an opportunity to see the city and acclimate to Germany and the time zone change. When I met with Daniel Mueller Osteopath and Eduard “Eddie” Erdeljac MD, DO1, I was greeted with warm smiles and Bavarian hospitality. Lindebergs Academy is like nothing you’ve seen and promises to be a hot bed of PRI in the coming years. 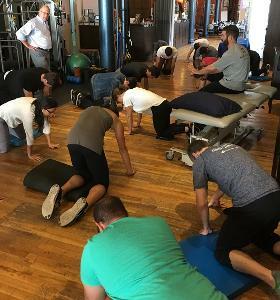 This Saturday I started with Myokinematic Restoration and by the time we finished on Sunday, the class was full of excitement and gratitude for learning a new science and a new way to manage clients. Betsy Baker-Bold was a fantastic addition as a lab assistant and her input was incredibly valuable. I am always amazed as I travel around the world disseminating the PRI news along with my interpretation of Ron Hruska’s vision, how friendly and caring the souls are that I meet. We may be from varying backgrounds and walks of life but we are no different at all really. I’m grateful to be here and I will keep you posted on next weekend’s adventures with Postural Respiration! 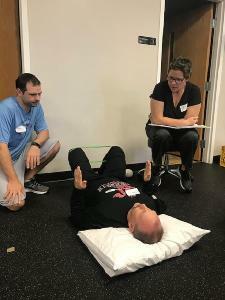 Thank you to Karen Taylor Soiles, PT, PRC, of Collaborative Physical Therapy, who, together with The Teal Center for Therapeutic Bodywork, welcomed 34 clinicians curious about the science and application of Postural Respiration. Karen’s attention to detail, including the wide array of healthy snacks, kept our bodies nourished and brains alert and focused throughout the weekend. The need to position the left hemi diaphragm was introduced right off the bat to ensure that the right diaphragm autocracy stops ruling our autonomics! Other key concepts included the need to facilitate hamstrings and IOs/TAs to establish a left ZOA followed by reach activities to hold the ZOA and direct air into previously-restricted areas of the rib cage. A series of gait videos enabled us to view firsthand various pelvic and thorax movement strategies. Lack of arm swing on one or both sides were reflected in our PRI tests. They served as a reminder that arm swing is 50% of the gait cycle! Thank you to Kathryn Bragg, PT, and Laurie Johnson, PT, seasoned clinicians tuned into nuances of performance of PRI non-manual techniques. The take-home from that discussion: So long as the reference centers are sensed by the patient, stated in the instructions as “You should feel…”, the exercise can be quite effective. Ultimately fine-tuning areas that are holding tension and tweaking alignment can help the process. With Jill Tender, DPT, as our superior T4 model, we succeeded in unearthing a compensatory respiration strategy that responds to additional non-manual and manual techniques beyond what is needed to manage those who have not yet resorted to this compensation. Others who enriched our learning-through-demonstration were: Amelia Franklin, DPT, OCS; Benjamin Fuentes, PT; Tara Pickett, DPT, GCS; Jacqueline Richards, DPT; and Karthik Yadagiri, PT. I really enjoyed my weekend with this wonderful group of clinicians. They gained an appreciation for just how influential alternating, reciprocal rib cage movement is to efficient movement and to the overall health of human physiological systems….and collectively rejoiced in the resolution of wallet-gate. We wrapped up the year for PRI Integration for Fitness and Movement courses outside of Philadelphia at Maplezone Sports Institute/The Training Room Physical Therapy in Garnet Valley, PA. We had a very awesome group that digested the principles of Breathing, Thoracic Posture, and Sensing Position and the Ground quite well. It really was a fun group to end the year with, so thank you to all that attended! And special thank you to The Training Room Physical Therapy staff and Rob Rabena at MSI for hosting! 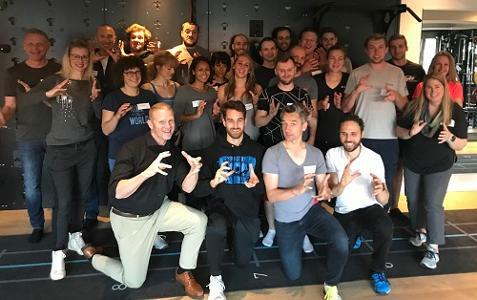 This PRI course heavily teaches components of breathing, pillar strength and axial frame mobility and their three dimensional relationship for cueing and coaching thoracic posture with proper pelvic position. A good coach can value learning how to coach and cue the core differently based off the position the athlete or client is in, i.e. with a unilateral asymmetrical loaded movement pattern and a symmetrical loaded movement pattern and we look to highlight those relationships in this course. This year we emphasized the parable of “parachutes and pancakes”. Teaching this parable throughout the year we’ve learned a few things on how people train and see (or don’t see) the diaphragm as an important core muscle. Our emphasis in teaching this parable is on helping attendees appreciate how training oblique abdominals and hamstrings to optimize respiratory postural balance is a key ingredient that should be incorporated in fitness and movement exercises. We know that when the ribs and thoracic cage are too stiff and rigid with ribs in external rotation, hyperextension, and hyperactivity the respiratory diaphragm can become tonic, flattened and underused, we could risk training the core in a compromised position and the “pancakes will become crepes” as the spinal mechanics becomes stressed which could further limit triplanar performance and lock up functional movement patterns, inhibiting gluts and other powerful muscles. On the flip side with people that might misuse abdominals or overdo flexion without unlocking the thoracic rings, we could create a different faulty pattern of forced thoracic folding when proper rib IR and thoracic retraction are not coordinated with a neutral pelvis. This could be a problem and would “fold pancakes into a pseudo folded parachute” which will bring about a different set of issues. Confusing?…. well maybe, but bottom line here, if you followed that, you get the parable! I’m looking forward to teaching this course in 2019. This year was such a blessing to learn from the attendees and help fill the gaps with new material as well as streamline how to teach the material. 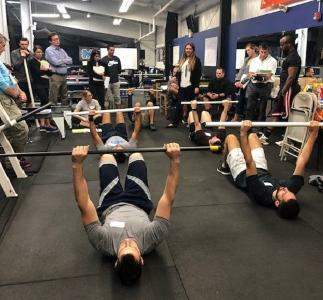 We’ve listened to feedback and continued to improve the course to share with the diverse crowds and specialty professionals working in various Fitness and Movement settings. A special thank you to James Anderson, our Affiliate course director, for all his hard work and dedication to make these affiliate courses a success. Hope to see many of you next year! Cervical Revolution. This class is such a game-changer for so many attendees and it can be for you as well. Did you know that cranial strain patterns as identified in the literature can and are frequently reduced through breathing techniques? Did you know that those same strain patterns are the result of cervical spine positioning? Did you further know that dental integration with PRI certified clinicians is an excellent mechanism for reduction of cervical patterned movement (or lack there of)? Did you know that dentists regularly attend PRI courses? This is because they realize that PRI provides them with the absolute best mechanism for aiding them in understanding the complexity of their neurological oral appliances. Our courses also arm them with understanding of a wide variety of other oral appliances as well! It is our hope that you will discover these exciting and new ways of learning the complexity of the human body as it relates to asymmetry. I taught Cervical Revolution this weekend in San Diego at Water and Sports Physical Therapy and this was a very nice place. I arrived a couple of days early to spend some time with Skip George DC, PRC going over the nuances of this complex course and then Skip and I waded into the material over the weekend as we presented to 25 attendees. Stephanie Kinsella DPT, PRC from Minneapolis was there. We also had dentist Jason Pehling DDS on hand as well. Dr. Pehling came down from Seattle along with our 3 great guys from Alpine Physical Therapy Chris “Murph” Murphy DPT, OCS, Eli Zygmuntowicz DPT, OCS and Jeremiah Ferguson DPT, OCS. These boys host courses regularly and are bent on achieving their PRC status soon. Good luck guys! A number of folks in the class indicated that they too were planning on gaining their PRC status as well! I encourage all of you to make that journey! I hope I see you soon in a Cervical Revolution class. You’ll be glad you attended! The definition of -ation is something connected with an action or process, or the process of doing something. I feel that I am doing this every time I teach this course. Processing references with desirable action to achieve outcomes that can become reprocessed through the integration of sense of this -ation. This can become a revelation for those who are struggling to change processing. Once again I appreciate Finish Line Physical Therapy for hosting another course in NYC. Tying the last hour of the course, humeral - scapular - thoracic activity with the first hour of the course, calcaneus activity allows the attendees to complete a full circle of sensory referencing, clinically and personally. This group was great in not only participation but in helping Kentaro Ishii MS, ATC/L, PES, CE, PRT rethinking about course organization. Michael Macchiarulo PT, DPT and Monica Saenz DPT thank you for representing the RAIC/LBC and LAIC/RBC pattern references throughout both days. Monica Integrating R AIC/L BC references while Michael integrates L AIC/R BC references. Michael integrating R AIC/L BC references while Monica integrating L AIC/R BC references. Brynn Fessette DPT, FAFS, Joshua DiLoreto ATC, and Chris Leib DPT, CSCS,Cert MD were awesome lab demonstrators and volunteers and enriched the course by their willingness to share their ‘sense’ of what they were feeling and integrating. But the best thing about teaching, is meeting new people, hearing new reasoning, and integrating new concepts based upon novice and novel experience. Boris Dugandzie and Dino Dogan were two people who exposed me to a culture and country that I knew vey little about. Because of them, Croatia is now on my travel destination bucket list. Their attendance helped me find a different kind of pronation and supination between two Croatians, who have little need to reach forwards or upwards with their arms and hands. Ron demonstrates the -ation, between the floor and the thorax between two Croatians, who struggle to find it.